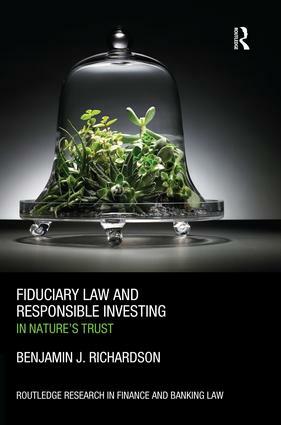 This book is about fiduciary law’s influence on the financial economy’s environmental performance, focusing on how the law affects responsible investing and considering possible legal reforms to shift financial markets closer towards sustainability. Fiduciary law governs how trustees, fund managers or other custodians administer the investment portfolios owned by beneficiaries. Written for a diverse audience, not just legal scholars, the book examines in a multi-jurisdictional context an array of philosophical, institutional and economic issues that have shaped the movement for responsible investing and its legal framework. Fiduciary law has acquired greater influence in the financial economy in tandem with the extraordinary recent growth of institutional funds such as pension plans and insurance company portfolios. While the fiduciary prejudice against responsible investing has somewhat waned in recent years, owing mainly to reinterpretations of fiduciary and trust law, significant barriers remain. This book advances the notion of ‘nature’s trust’ to metaphorically signal how fiduciary responsibility should accommodate society’s dependence on long-term environmental well-being. Financial institutions, managing vast investment portfolios on behalf of millions of beneficiaries, should manage those investments with regard to the broader social interest in sustaining ecological health. Even for their own financial self-interest, investors over the long-term should benefit from maintaining nature’s capital. We should expect everyone to act in nature’s trust, from individual funds to market regulators. The ancient public trust doctrine could be refashioned for stimulating this change, and sovereign wealth funds should take the lead in pioneering best practices for environmentally responsible investing. Professor Benjamin J. Richardson holds the Senior Canada Research Chair in Environmental Law and Sustainability at the University of British Columbia. His long-standing scholarship on socially responsible investing, sustainability and the financial economy includes the books Socially Responsible Investment Law (Oxford University Press, 2008) and Environmental Regulation through Financial Organizations (Kluwer, 2002). This series explores the key developments in financial and banking law, offering critical analyses of legislation and regulatory frameworks at the international regional and domestic levels. Legislation, case law, regulatory structures and institutions are discussed from a variety of theoretical and methodological approaches. The books in this series provide valuable and far-reaching investigations into the challenges of regulating finance and banking in a fast-moving and interconnected global economy.